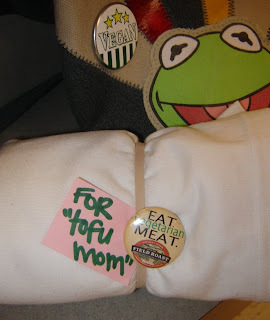 So we just returned from Seattle's amazing VegFest extravaganza ...and we're dead tired and stuffed to the eyeballs with good and wondrous vegan foods. I'll post the entire story tomorrow, but for now, I have to tell you one little anecdote... this TOTALLY made my day. TOTALLY. We had just walked into the Exhibit Hall and were dealing with the momentary sensory overload of several hundred bright and colorful booths, with 500 different food samples being cooked, eaten, advertised and given away... Wow. My kids and the friends with us immediately rushed over to their booth for (what else?) free samples! OK, we buy the stuff all the time, you'd think we'd leave some for the poor souls who haven't yet had the privilege of indulging... but oh no... there we were, filling our faces. "MMmmm, *snarff*snarff* try the Apple-Sage.. No, the *snorg*snarff* Chipotle is better..."
Flattering. Stuffing our cheeks like chipmunks ...err... sampling all the wondermous sausages (because it's so freakin' GOOD), one of the employees RECOGNIZED my glamorous self and said "You're Tofu Mom! Wait, we have something for you..."
At this point, let me say, I'd been harassing the poor Field Roast people on their blog for a few weeks, asking and hoping they'd be at VegFest yet again this year. They couldn't let me down - I mean, I'd told only about 6798789 people that they had to sample Field Roast, even if they tried nothing else the whole day!! But, glamorous or not, I was still amazed and surprised they recognised me. So cool! Cooler yet, the employee pulled out a Field Roast Tee Shirt. With my "name" on a little sticky on it. (ignore my purse in the background). Look at THAT! They'd been saving it there, just for me, with a zillion and twelve other crazy veg people milling around. How very, very SWEET is THAT!?! I was SO excited I may have almost peed my pants. The Field Roast peeps though? Made my day. Totally. 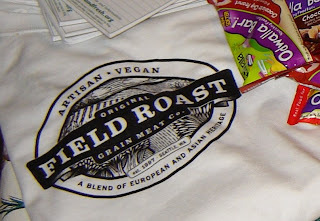 Lotta love for the Field Roast - YAY!!! Go buy some sausages!! (I'd say that even without the tee shirt.) But now I want to stand on a street corner and wave them in the air. And the tee? Well, I WORE it. Duh! Several people asked me if I was an employee. Ha. No. But I have an official (?) shirt, whee. Now I think I'm going to tie-dye it. It's so awesome. Stay tuned. Happy Sunday. More VegFest notes tomorrow!! haha, that's awesome! I can't wait to hear all about vegfest--*eyes shine up* one day I too will grace the halls of the festivities of veg. Till then I live through you--so rest well my dear and post up! Yay for blogging fame!! I was up in Seattle this weekend for vegfest too. Can't wait to hear what you thought of it.... I am personally still full. I know this is probably not the place to contact you, but I didn’t see an email address. First, congrats on your 15 minutes of fame! That must have been such a surprise. I wanted you to check out my latest recipe because it is entirely vegan, and my kids loved it. Also, do you have a recipe for "meatballs"? When my daughter was in the hospital they served her vegetarian meatballs with spaghetti sauce. Or do you use a packaged product? Could you also advise me how to get my food blog out to more people? I am very new at this blogging thing. Thank you! That is so very cool! You know, it's really amazing how the little things in life are those that make us most happy. That is SO AWESOME!! You really are a vegan celebrity. Unfortunately, Field Roast products are not available in Canada, (I've e-mailed them) and I'm totally bummed because I've only ever heard great things. I'll have to look again the next time we go shopping in the States. Don't you just love veg food fairs? Can't wait to hear about the rest of your adventures. It's good to be famous! Enjoy it! Congrats on the t-shirt and being famous!! I agree with you. 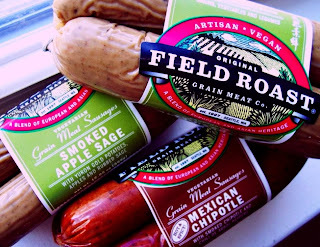 The Field Roast products are yummy. so jealous! i'm in love with field roast. i'm also jealous of the vegfest. i've never seen one around where i live (and i live 15 minutes from nyc). i hope your "sprout" has a wonderful and safe time in Mozambique! Wow vegfest sounds like heaven. How absolutly amazing of them to have gifts set aside just for you! and am so happy to hear they are "regular folk." Do you mind if we use one of your pics off your blog and link to your blog in our next newsletter?